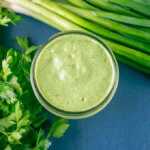 Vegan Green Goddess Dressing Recipe | Yup, It's Vegan! 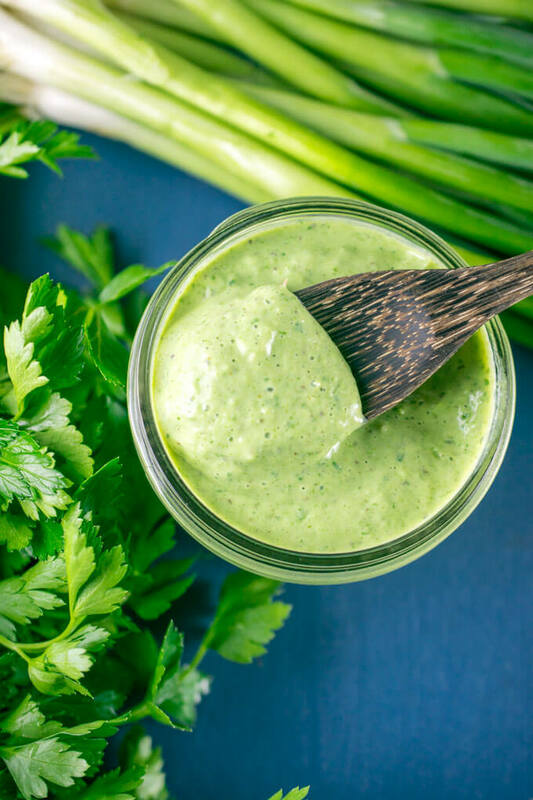 Creamy, secretly-healthy vegan green goddess dressing, made with fresh ingredients and packed with herbaceous flavor! When researching my vegan caesar dressing a few weeks ago, I learned that the mundane origin story of caesar dressing is that a chef made it up with the ingredients he had on hand. The story of green goddess dressing is ever so slightly more intriguing than that, with a San Francisco chef creating in homage to an actor whose play, Green Goddess, was popular at the time. In the case of both caesar and goddess dressings, despite being created worlds apart, anchovies managed to make it into the recipe. So my mission for this vegan green goddess dressing was create a punchy flavor minus the fish and the mayo. I originally served up this vegan goddess dressing recipe back in February 2014. Recently I made it again, thinking that, like many of the recipes from the extremely early days of my blog, it would need a little bit of “retouching” to meet my 2019 standards. Especially considering it was an oil-free dressing made from silken tofu. Well, I was certainly wrong! I made my original vegan green goddess dressing as written and it’s already great, plus it’s healthy too! Because of the whole tofu thing, it’s a nutritious, whole foods dressing with no added oil or sweeteners at all. The only change I made was to use a slightly less vampire-deterring amount of raw garlic. The original chef made his goddess dressing with a mayo base, garlic, tarragon, parsley, chives, and scallions. I’ve used all four of those lovely herbs here, and I sometimes add basil too if I have it on hand. The mixture of herbs makes this vegan green goddess dressing positively verdant and brimming with so much bright flavor that you really can’t tell there’s tofu in there. I’ve heard rumors you can make goddess dressing that’s made of avocado or tahini as the base, instead of tofu. I suppose cashews would also work. But I’m here to assure you that if one of those things tasted better than tofu, I’d use it. Something about the lightness of the tofu is just perfect for this herb-forward dressing. This vegan green goddess dressing can be served over any sort of lettuce or greens; a grain like quinoa (recipe coming soon! ); spring vegetables like asparagus; cucumbers; or other fresh veggies. I also think it would be lovely with fresh sweet corn. 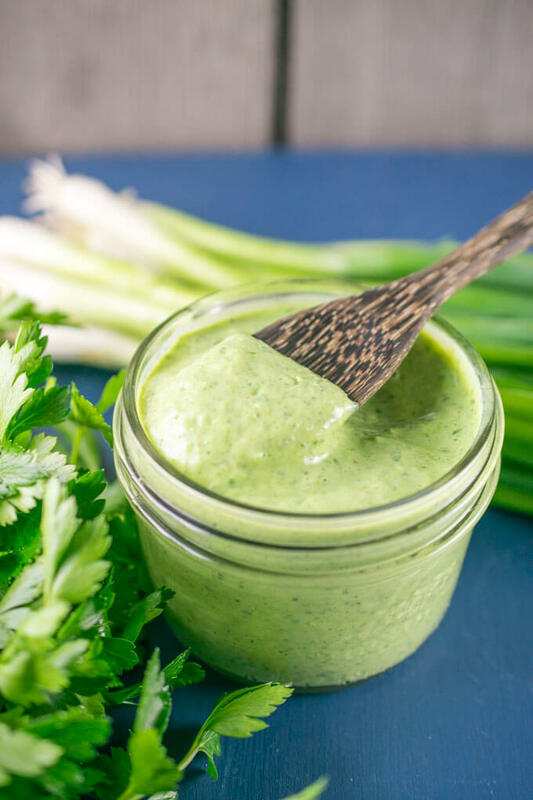 Spring is right around this corner and my vegan green goddess dressing is ready to take you there! Skip the Annie’s or Trader Joe’s versions and make your own, you won’t regret it. And if you do, please leave a comment here or tag me in your photo on Instagram (@yupitsvegan)! Creamy vegan green goddess dressing that's casually healthy thanks to being made of tofu! But seriously, you wouldn't know. This is an herb-forward dressing that's perfect for spring! If you're not familiar with tarragon, it has a gentle licorice-like flavor, like a more mild fennel or anise. Open the package of tofu and drain the excess liquid. Add the tofu, garlic powder, salt, pepper, lemon juice, and mustard to a blender or food processor and run until completely smooth. Season to taste with additional salt, pepper, mustard and lemon. SILKEN TOFU: Silken tofu is often sold in a shelf-stable, cardboard package. A common brand is Mori-Nu. Sometimes it is sold water-packed and refrigerated like "regular" tofu (aka cotton tofu). Only use silken tofu for this recipe; cotton tofu is too grainy and has more excess liquid that needs to be pressed out. A former favorite dressing! So excited for this dairy-free version. I read everything in your blog and recipe and can’t find if you mention how long it would keep? I’m the only one in the house who likes these flavors, so I’d need it last a little while in the fridge. I haven’t tested the limits of this dressing yet, but it lasted at least a couple of days for us. After about 2 days it started to separate a little bit but I whisked it back together and it was as good as new. If you’re planning to store it for a while you might want to forgo the fresh basil. This has been a favorite recipe of mine for a long time and the new photos look great! I love it on everything! Thanks for all of the great recipes!